Remember when I said waaaay back last January that I needed to refinish my steps? Then in September I gathered up the gumption to get started but eventually only ended up getting 4 steps completed before I could come up with enough excuses to put it off as long as possible. Well, between feeling guilty and my wife's not-so-subtle but yet tastefully sarcastic hints ("Yes honey, I absolutely LOVE the first 4 steps of our stairway. THANK YOU for doing that! No, don't bother with the rest of them, this was all I ever wanted.") - I finally got around to working on them again. So, after taking 2 vacation days this week, I was able to make some serious progress. 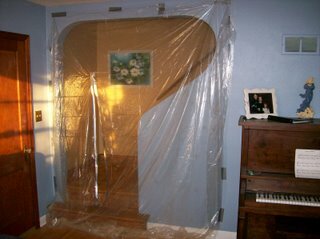 Here's the barrier I had to create to keep the dust from infesting the rest of the house. And here's ol' Bubble Boy stripping the finish off of the last tread below the landing. No problem, they should be finished by lunch. 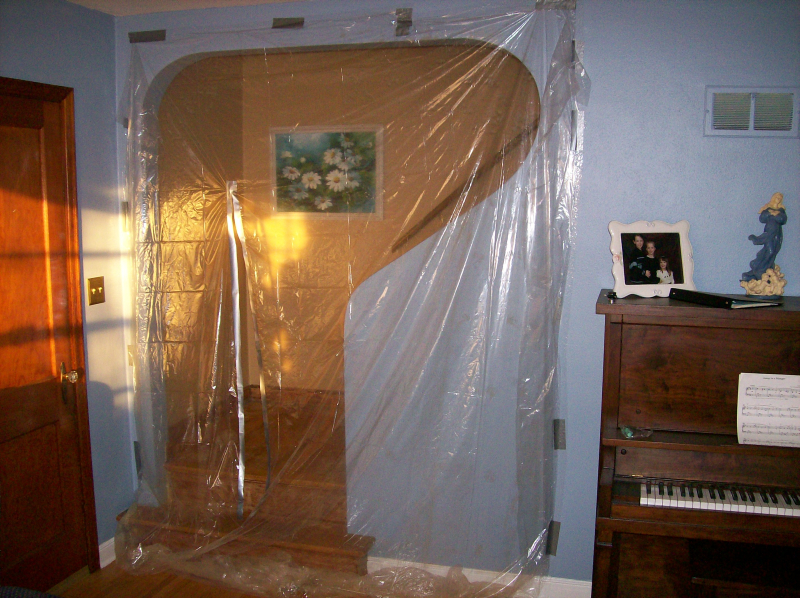 We had a house in Wichita with carpeted stairs (two sets) and I hated vacuuming those things. But I guess, as my father-in-law likes to point out, it could be worse! This gives new meaning to the phrase "Take it one step at a time". ...And he's sanding a stairway to Heaven. When I was young we had a record that we listened to on our wind up record player. It was called, "Climbing up those golden stairs" Anyone ever heard of it? I think you may have gained a step up with your work. Oh my I do not envy you at all. I hope your wife likes the rest of the stairs.....even though 4 was enough, right? When you get it done...(should I have said IF?) I want to hear about it. WE are royalty at starting projects that we don't finish here. Please finish it. Your wife will surely thank you for it. You want that thank you. Me too, I was wondering when those stairs were going to be finished! Now where do these stairs lead too while you're working on them? So much fun, isn't it? 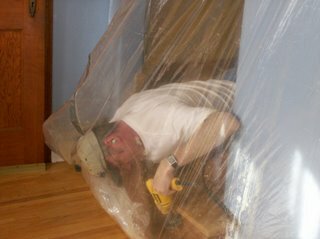 When we put in hardwood flooring in the kitchen 3 years ago, I thought I was headed for the asylum...seriously. By the way, where's the photos of the tree? You must get tired of people stepping on your head to get upstairs. 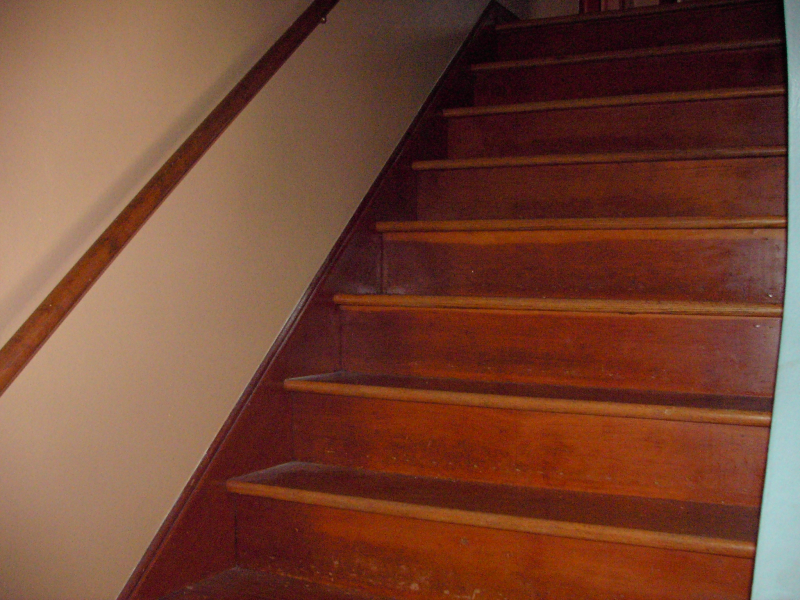 By the time you get this done, the first four steps will need refinishing.